I've made a little bit of progress on my craft room since the last time I posted about it. I was given a desk and it has a ton of storage so I'm finally getting some stuff organized. (More on that later.) 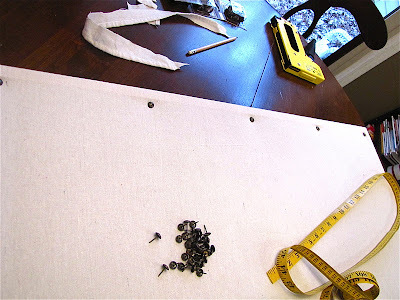 I was flipping through my new Pottery Barn Catalog last week and saw this awesome linen covered pin board. So I set out to make something similar! It was so easy. Let me show you how. 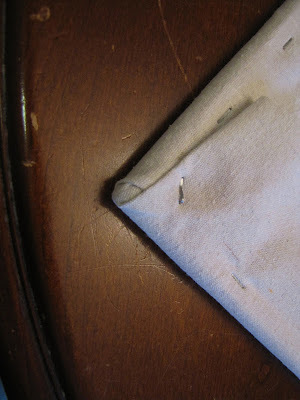 I love the look of linen and was originally going to use it for this project. I decided to cut a piece off of my canvas drop cloth instead since it has a similar color and texture and I'm using my linen to make pillows. I'm still very pleased with the way it turned out and glad I'm not poking holes in my linen. 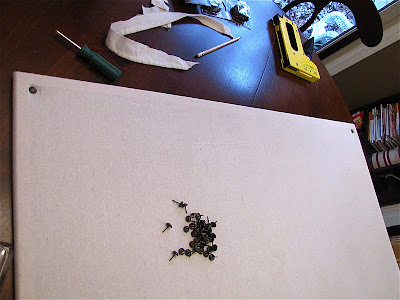 =) I just laid out my drop cloth and cut a piece out a little bigger than my cork board. I did this project on my kitchen table and I don't recommend it! When I went to hammer my tacks in a little piece of the end came out the back of the board and indented my table. I should of used my craft table instead. Live and learn right! Ok so back the the project. 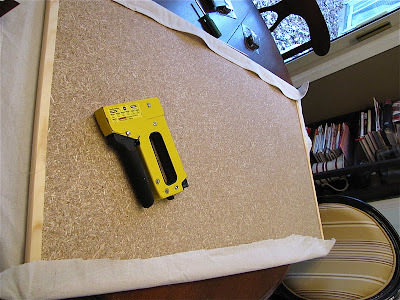 Wrap the fabric around the front of the cork board and pull them tight around the edges. Staple the ends of the fabric to the wood frame on the back of the board. I folded my corners in like this. I cut two holes in the fabric where the nails attach it to the wall in the back. 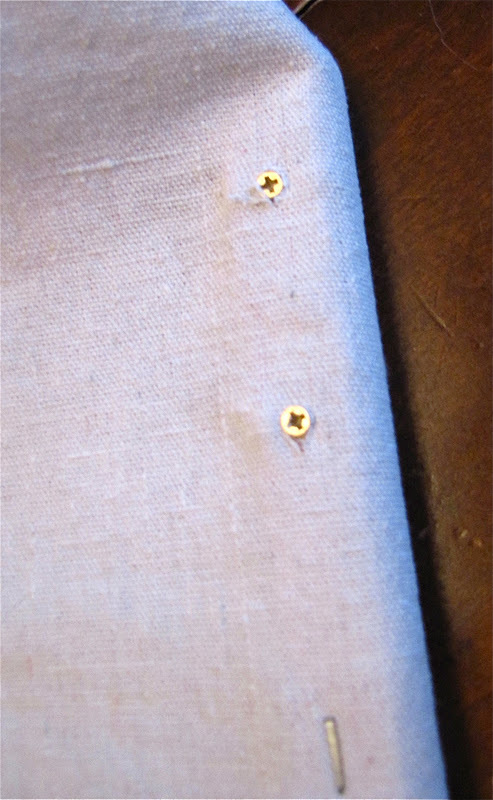 After I finished stapling all the fabric down I trimmed the edges so it looked like this. Now for the upholstery tacks. I started putting one in each corner. And then one directly in the middle of the two. And then I did the same with the other tacks placing each one directly in the middle of the two beside it. 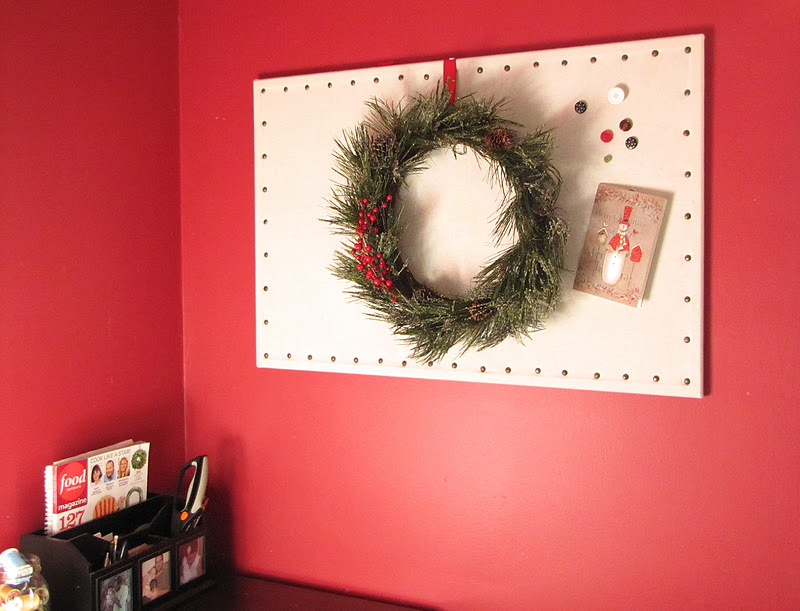 After I put all the tacks in where I wanted them I hammered them into the board to make sure they were all the way down. This is the part I should have done on another table! 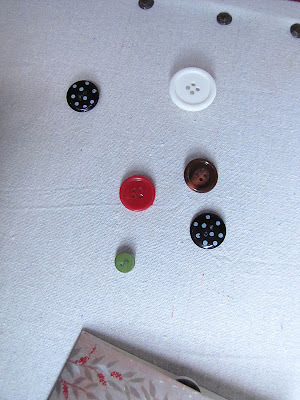 I hot glued buttons onto regular thumb tacks to add a little whimsy. 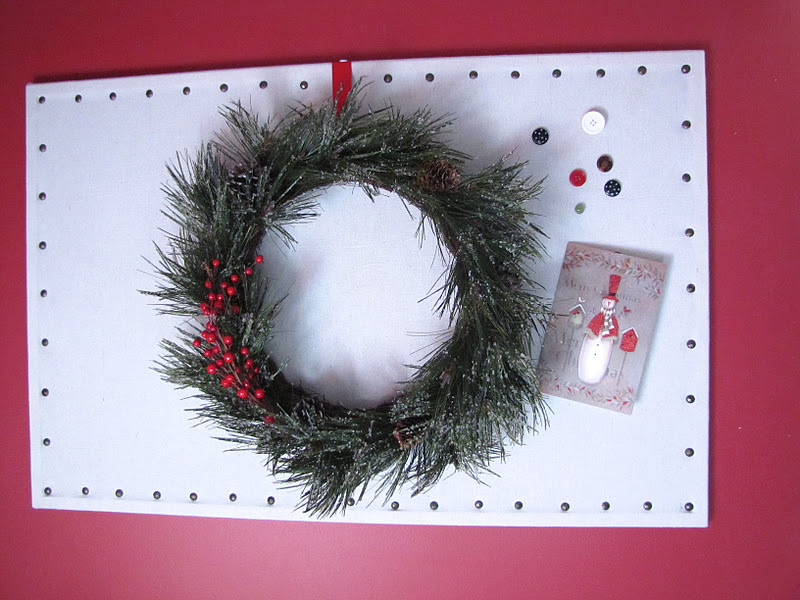 So here it is now in my craft room displaying our first Christmas card of the season! Woo-hoo! Linking up with some of these parties. Check them out! I love this! I recently made a bulletin board framed with striped upholstery webbing and I love this idea too. 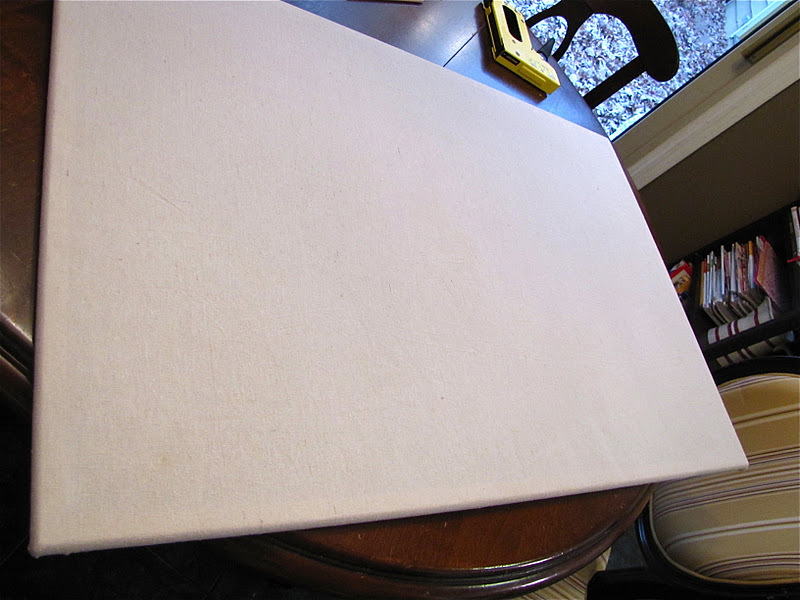 Maybe I can use two bulletin boards!